We are creating a constantly evolving, radiantly healthy forest ecosystem with nutritious delicious fruit and other food items as a major output. The forest is intended to serve as an educational demonstration site, where community members from Kaua`i and beyond can learn and innovate subtropical agroforestry techniques and management through practical hands-on experience. In addition, the forest is a renewable source of biological diversity for reproduction, distribution, and conservation. The concept of the food forest began to emerge in 2010, following a permaculture design course on Kaua`i the year before. The forest was a natural extension to the Kalihiwai Community Garden, eastablished in 2009. Informational meetings were held in early 2012, followed by a one-day workshop on planning and planting a perennial food forest held in May. Pre-installation design of the forest continued through the summer, and shaping of the land was done in November. The food forest officially commenced with a large-scale planting on the long weekend of December 1-3, 2012. Before humans arrived, Kalihiwai Ridge was almost certainly dense forest, with an impressive diversity of plants, birds, insects, and other native organisms found nowhere else on earth that had co-evolved and adapted to the land over a 5.5 million year period. Soil at the food forest is the result of a lava flow that developed about 1.5 million years ago. Human impact was probably slow, as the Polynesian settlers did not focus their activities in upland areas until the coastal and lowland resources began to be diminished. In 1863, the land that is now home to the food forest was sold by the Hawaiian monarch Kamehameha IV to Charles Titcomb. Sugarcane was grown on the land from 1880 until 1971. From 1977 until 2006 the land was managed as a large-scale guava plantation. When that operation ceased, the land was purchased by Bill & Joan Porter, cleared of guava trees, and for 5 years the two-acre site of the food forest was a gently sloping field of mowed grass. Permaculture seeks to take care of the land, people, and reinvest energy into the system for long-term abundance, productivity, and resilience. Sustainable agriculture’s goal is to provide for today’s needs without jeopardizing the future needs of our children grandchildren, and all life on Earth. We try to design and refine our practices of land and ecosystem management mindful of the ethical standards of permaculture and sustainable agriculture. Often the basis of our practices comes from traditional knowledge specific to Pacific islands agroforestry. We also keep abreast of the latest findings and best management practices from researchers in university, government, nonprofit, and commercial agriculture organizations. It’s no secret that Kaua`i and other remote islands in the Pacific are overly dependent on food imports to sustain its people. 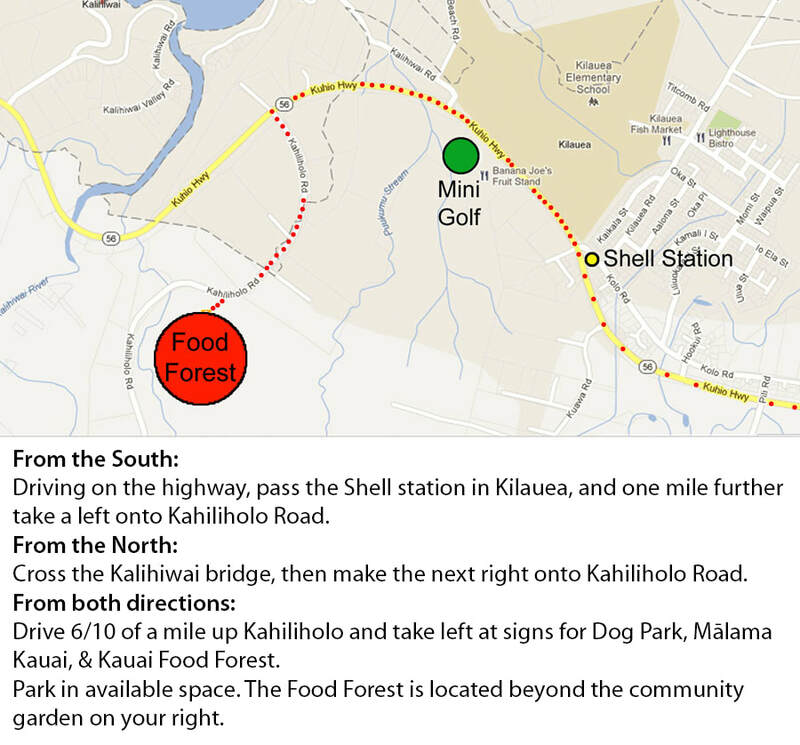 The Kaua`i Food Forest has and will continue to positively impact our the community by inspiring and training homeowners, farmers, and organizations to establish and maintain food forest systems around Kaua`i and throughout Hawai`i. More food forests means more food sovereignty through access to healthy locally-grown food that can be consumed immediately after harvest for maximum nutrition. Each food forest that is established can generate the seeds and cuttings needed to begin new food forests, as well as drive innovation as each forest is tailored by the ingenuity and preferences of its creators.